The Hole’s facelift is almost complete. GRAMBLING, La. – Hellas Construction, the company charged with installing the new turf at Eddie G. Robinson Memorial Stadium, has made significant progress on installing the new, state-of-the-art field. Despite continuous weather delays, the Hellas crews have made great strides to reach the anticipated completion date of Aug. 25. So far, the old field has been excavated, a new retaining wall has been installed and a new drainage system has been put in place. Additionally, the goal posts have been put in and the Cushdrain Shock Pad has been installed. All that remains to be done is the turf installation, which will begin in the coming days. Significant progress has also been made on the new scoreboard being installed by Nevco, Inc. The board has been put in and all that is left to do is the wiring and the installation of the back cover, which will be a lighted “G”. The scoreboard is scheduled to be completed by mid-August. 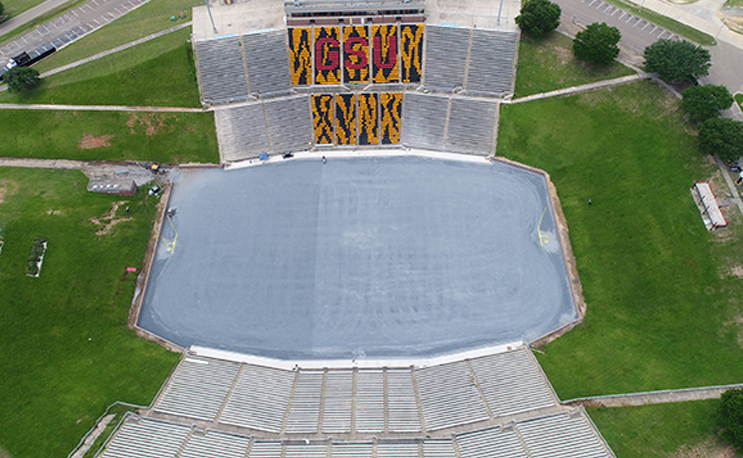 We at HBCU Gameday love some good drone and timelapse footage and have been following the progress over at Eddie G. Robinson Memorial Stadium all summer on Grambling’s Facebook Page.